From the January 2011 E-Block. In terms of the authorship of the New Testament documents, an argument that is used in many contexts for the letters of Paul (but also Peter and others) makes much over alleged vocabulary differences that indicate a difference in author. In this article, I’d like to generally discuss this sort of argument, which I consider to be of little to no use in determining the authorship of ancient documents. My first misgiving about such arguments is that statistically, they are generally without merit. This is often illustrated by modern comparative examples. In one instance, R. C. Sproul relates the following story in at least two of his books: One of the least scientific methods used to criticize authorship is the study of what is called the incidence of hapax legomena. The phrase hapax legomena refers to the appearance of words in a particular book that are found nowhere else in the author's writings. For example, if we find 36 words in Ephesians that are found nowhere else in Paul's writings, we might contend that Paul could not have written Ephesians. The folly of putting too much stock in hapax legomena came home to me when I had to learn the Dutch language in a hurry for my graduate work in the Netherlands. I studied Dutch by the "inductive method." I was assigned several volumes of theology written by G.C. Berkouwer. I started my study by reading his volume on The Person of Christ which was in Dutch. I started on the first page with the first word and looked it up in the dictionary. I wrote the Dutch word on one side of a card and the English word on the other side and set about the task of learning Berkouwer's vocabulary. After doing this on every page of The Person of Christ, I had over 6,000 words on cards. The next volume I studied was Berkouwer's The Work of Christ. I found over 3,000 words in that book that were not found in the first one. That's significant evidence that The Work of Christ was not written by Berkouwer! Note that Berkouwer wrote The Work of Christ only one year after he wrote The Person of Christ. He was dealing with the same general theme (Christology) and writing to the same general audience, yet there were thousands of words found in the second volume that were not found in the first. Note also that the quantity of Berkouwer's writing in the first volume far exceeds the total quantity of writing that survives from the pen of the Apostle Paul. Paul's letters were much more brief. They were written to a wide variety of audiences, covering a wide diversity of subjects and issues, and were written over a long period of time. Yet people get excited when they find a handful of words in a given Epistle that are found nowhere else. Unless Paul had the vocabulary of a six-year-old and had no literary talent whatsoever, we should pay little attention to such unbridled speculation. While Sproul gives us excellent food for thought, his analogy is not as good as we might like. The reason for this is that modern languages like Dutch and English may have upwards of a million words. In contrast, an ancient language like Hebrew or Koine Greek, may have only a few thousand or tens of thousands. According to several sources, the New Testament itself has a vocabulary of only about 5000 words, and one source claims that around 300 of those, account for 80% of the words in the New Testament. This would tend to accord with our own use of vocabulary; though English may have a million or more words, most of us use only a few thousand on a regular basis. Thus in a sense, ancient people did “have the vocabulary of a six year old” – a modern one – because they had so few words to begin with. This does not mean they were more ignorant, of course: In their high context society, a single word might have multiple “duties” assigned according to its context. This is one reason why it is oversimplified to stroll through a concordance and attempt to ascertain the meaning of a NT word across the entirety of the NT based on one or two uses. Skeptics frequently engage in this sort of erroneous practice (what one scholar calls “illegitimate totality transfer”). Still: Does the fact that Koine Greek may have only a few thousand words in any sense make the arguments about vocabulary more likely? Statistically, yes – but only more likely in the sense that it is more likely that an asteroid will hit a particular state or nation than that it will hit a particular person. The general logic still holds: The nature of vocabulary is such that a certain small percentage of words will appear most frequently as our most used words. For the remainder, it is foolish to use these as a basis for deciding authorship, especially given the rather narrow window we have into the literary lives of the NT authors (a point on which Sproul remains manifestly correct). As I have related in other contexts before, the role of a scribe in antiquity makes arguments based on vocabulary highly questionable. As authors like Richards have shown in The Secretary in the Letters of Paul, a scribe could be assigned responsibility for a work along a wide range of potentialities: They might serve purely as receivers of dictation, or they might be full-fledged authors who are merely told what to do in very general terms, with the credited author simply reviewing the work and signing off. My research for Trusting the New Testament indicates that many Biblical scholars simply do not give this aspect of ancient composition enough consideration. Many simply dismiss it, with a trace of impatience, as some sort of excuse manufactured by those who wish to preserve the authority of the New Testament. But this is a non-response to a genuine phenomenon of ancient composition. It seems rather that these authors do not wish to accept that scribal activity renders many of their carefully crafted arguments essentially useless. Indeed the resulting “chaos” for deniers of the authorship of NT documents could be considerable: They have almost unanimously accepted Romans as Paul’s work, yet it is also one of his letters where the work of a scribe is most apparent in terms of testimonial evidence: "I Tertius, who write the epistle, salute you in the Lord" (Rom 16:22). If Romans, the letter among those most certainly ascribed to Paul, was influenced by a scribe, what will this do to using Romans as a guide whereby other letters like Ephesians might be judged? In the end, the hands of scribes make the burden much heavier on those who would deny authority (which, for ancient people, also amounted to authorship) to any New Testament book. Beyond such elements as anachronisms, factors like vocabulary simply become useless as tools for making judgments, as do numerous other factors associated with writing style. One can readily understand why critics would be hesitant to abandon what they would consider one of their “star players”. There is one final factor we might discuss related to vocabulary as a determining factor in reckoning authorship, and that is the frequency of quotations and allusions. Since ancient writers didn’t have quote marks, we can often only recognize these occasionally. But it could be a larger factor than we realize. The classic case is that of Ephesians and Colossians, which both seem to use a great deal of creedal and hymnal material, which would obviously fudge any attempt to argue against their Pauline authority based on vocabulary. Since this was a high context society, though, it also seems likely that there would be a great many other allusions in the NT texts that we would be unable to recognize – especially if they were allusions to something a person once said, or something in a document not available to us. In summary: Tests based on vocabulary are questionable enough as is, and require some stringent rules to be valid. However, even more stringent rules would be needed for an evaluation of ancient documents – and the use of vocabulary tests to determine authorship is therefore far less effective than many critics are willing to concede. From the way some critics go on about talking animals in the Bible, you would think that the Scriptures hosted a veritable Country Bear Jamboree. Not so. I decided to do this article as a thematic one to see what objections I could gather on the subject. I found two stories repeated in the main, one of which we have handled before and which I will address here again with additional comments – that’s Balaam’s talking donkey. What else is there? There’s the talking serpent of Genesis, of course. And…well, we found some other interesting claims we’ll bring to the fore as well. It was some sort of “supernatural” intervention. It is obviously true that God could miraculously grant to an animal the ability to talk (inclusive of the necessary physical and mental apparatuses). This would certainly be no difficult feat for the Creator of entire galaxies. It was an act of ventriloquism. In other words, the animal was used as a sort of mouthpiece by some other being. This could be either God or Satan, an angel or a demon. It’s a joke. A joke? Yes. In fact, that’s the argument I have already preferred for our first story, on Balaam, and will now develop for our second story. The way Spero sees things, however, matches the NT reputation of Balaam quite well. In his view, Balaam was just your run-of-the-mill pay-for-prophecy diviner; and his seemingly pious remark to the Moab princes that he would have to ask God what to do was just a tactic. As Spero sees it, the Moabites "probably winked and nodded at each other knowingly, realizing such 'God talk' to be only a facade behind which Balaam deliberated whether the price was right" -- in other words, Balaam did not know God at all (though he obviously knew of God); and the Moabites were asking Balaam to play the typical role of the diviner, as one who could manipulate the gods and influence their decrees...little aware that Yahweh was not that type of deity. Fast forward to that night. Balaam wasn't making any plans to actually consult God, but lo and behold, God came to him. We are now to imagine, Spero suggests, a shaking and trembling Balaam coming forth and refusing the offer. Perhaps so -- perhaps the Jewish reader would have understood that God had not actually spoken to Balaam, and have gotten a good laugh out of Balaam claiming to have heard from the Almighty. In other words, perhaps it was an obvious joke, one that we have lost sight of. Either way, Spero now sees the second offer as an indication that the Moabites simply thought that Balaam wanted more money -- and this, we may note, matches well with the condemnation of Balaam in the NT. So now we move to the next episode. The Moabites come back to Balaam's door; he hints at payment in a roundabout way; that night, God tells him to go ahead -- or does He? Spero thinks there is more to it. "God is mocking and playing with Balaam the idolater even as He mocked and played with Pharaoh." This is followed by the most "exquisite irony" as Balaam, the self-proclaimed prophet of God, isn't even able to see the angel of the Lord in front of him -- while his donkey can see it, and has to tell him about it. The purpose of the story, then, as Spero sees it, is to "debunk the false notions of the age and to poke fun at the pretenses of self-serving men who deceitfully claim to have the power" to hear God. Since my subject in that article was not precisely animal vocalization, I did not develop this point further, but will do so now. If this entire episode by Balaam is a sort of parody of history – one intended to mock Balaam – then the “joke” would be that Balaam isn’t listening to God when he delivers his oracles; he’s listening instead to a donkey – which is not to say, he literally gets his prophetic news from donkeys, but he might as well be, and he’s all the more fool because of it. This would make sense of other aspects of the story that have raised questions. It explains why Balaam is not stunned when a donkey speaks to him, for of course, it is a joke: The donkey here probably represents Balaam’s fevered imagination, and the story essentially labels him a false prophet and a fool. However, the “joke” thesis appeals to me more, partly because it reflects my own rather wicked sense of humor, but also because it is specifically a donkey Balaam has a conversation with. If Balaam was also having conversations with rocks and walls, this would surely have been even greater fodder for mocking this reputed prophet. The question now left: Is this a better explanation than the other two – both of which hypothesize some sort of “supernatural” intervention? We’ll look at some reasons that might be given, for this and our second story, below, which apply to both. Here, specifically, though, there’s not much reason to opt for 1 or 2 above. The donkey’s message is composed of a mere two sentences, neither of which would serve much purpose for either side of the “supernatural” realm in turning Balaam either way. All they do it make Balaam look like a fool – which is in accord with the “joke” thesis. Indeed, since Balaam essentially loses the argument with the donkey – having to admit his behavior towards it was unjust. The serpent, which many ancient cultures regarded as an evil (but also wise) creature, would become a perfect “editorial cartoon” figure to represent the evil being in Genesis (whether Satan or some other figure, matters little). ...four beasts full of eyes before and behind. And the first beast was like a lion, and the second beast like a calf, and the third beast had a face as a man, and the fourth beast was like a flying eagle. And the four beasts had each of them six wings about him; and they were full of eyes within; and they rest not day and night, saying, Holy, holy, holy, Lord God Almighty" (Rev.4:6-8). Obviously, though, being that Revelation is an apocalypse filled with unreal images, including this one in the “talking animals” category is far too literalist. After this, I found objections about talking objects other than animals. The most appealed to was the burning bush in Exodus, though since the voice is identified as that of YHWH, it seems clear that this one was an act of “ventriloquism” rather than of horticultural enunciation. Yet another such incident is when Jesus says that the rocks will cry out if his followers are silenced in praising him (Luke 19:40). This, of course, only implies that the rocks will cry out, they never get their chance to sing but the fact that it is a feasible occurrence raises some fundamental questions about the nature of geology. Apparently Yahweh has designed the rocks with the ability to cry out, if ever Jesus stops being praised, whether they are sentient or merely set to react to a lack of praise is never addressed. I probably don’t need to say much about a person like this who can’t grasp the elements of comic hyperbole. How does this affect the doctrine of inerrancy? It doesn’t It only does if we assume that the intent of the texts was to relate that there was, literally and historically, a talking snake or donkey. If the intent was to have a jab at someone, then what is being inerrantly related is facts like, “Balaam was a false prophet” – via the medium of a joke. How do we tell a joke from real history? The same way we’d do it if we learned another language from a culture with forms of humor we didn’t understand. There’s no shortcut. My analysis here is based on a general understanding of the broad and vivid sense of humor one finds in Biblical texts and culture, with strong emphases on hyperbole, irony, and wild figures of speech. Those who think a literal reading is better will have to produce their own arguments as to why, contextually, it is to be preferred – and it will not be enough to say, eg, that it threatens common perceptions of inerrancy and interpretation. Article on Balaam is here. 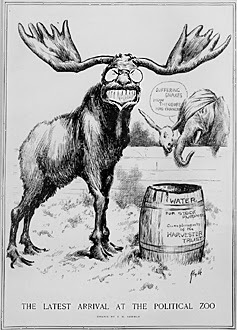 This time we have a guest post by W. R. Miller, who has a few words for a fundy atheist out there whose cartoon associations are his best scholarship. How nice it is to promote science. Astronomer Phil Plait has posted a comic strip online to entice budding young minds, called, “You’re Gonna Like It Here.” It evokes the wonders of nature, emphasizes the joy of discovery. It poo-poos quackery and the occult, and rightfully so. But Plait, being atheist, might be surprised to learn that modern science was pioneered by Christians. Or if he does know, he doesn’t give credit where it’s due. There’s an implication that theism is not a motivating factor in the pursuit of knowledge. Plait remarks, "No psychic, despite their claims, has ever helped the police solve a crime. But forensic scientists have, all the time." Who was the founder of forensic medicine? German physician Johannes Bohn, a Lutheran. And Christianity forbids involvement with the occult. Plait claims, "It wasn't someone who practices homeopathy who found a cure for smallpox, or polio." There is no cure for polio. It can only be prevented. If Plait means to extol the virtues of science, an error like this is hardly exemplary. The American Journal of Public Health credits William McDowall Hammon of the University of Pittsburgh Graduate School of Public Health as leading "the first major breakthrough in prevention of the disease [Poliomyelitis] by using passive immunization in one of the earliest double-blind, placebo-controlled clinical trials. This study provided the first evidence that antibodies to poliovirus could prevent the disease in humans." He is also an ordained Methodist minister. As for smallpox, English physician Edward Jenner introduced vaccination against smallpox and thus laid the foundation of modern concepts of immunology. He invented the term "virus." He is credited with the ultimate eradication of smallpox. And he was a Christian. Dr. William Foege, according to UNICEF, “has played a key role in many of the major important public health advances of the 20th century, including the eradication of smallpox, successful attacks on Guinea worm disease and river blindness, and the creation of a model for improving nutrition in developing countries.” He is Lutheran. See also here. One panel misleads with the statement, "No creationist ever cracked the genetic code. Chemists did. Molecular biologists did." Austrian botanist Gregor Johann Mendel is credited as the founder of modern genetics. He was an Augustinian monk. Creationist “code-crackers” include Dr. André Eggen of France, Dr. Robert H. Eckel of the University of Colorado, Franklin D. Enfield of the University of Minnesota and others that can be found here. Plait boasts, “I know a place where life began, billions of years ago.” How does he know? He doesn’t. No one on this world has lived that long for empirical observation. Conjecture is not proof. The strip ends with a girl gazing at the stars through a telescope. “You’re gonna like it here,” Plait says. It’s a sentiment shared by Christians over the centuries. God’s universe exists to be explored! And so the cause of astronomy was advanced with such notable Christians as Tycho Brahe, Johannes Kepler, Galileo Galilei, Laurentius Gothus, Pierre Gassendi, Anton Maria of Rheita, Juan Lobkowitz, Seth Ward and many others acknowledged by The Galileo Project. Dr. Jonathan Sarfati, “The Biblical Roots of Modern Science,” September 29, 2009. Michael Bumbulis, Ph.D. "Christianity and the Birth of Science." H. F. Cohen. The Scientific Revolution: A Historiographical Inquiry, University of Chicago Press, 1994. Pierre Duhem, Le système du monde; histoire des doctrines cosmologiques de Platon à Copernic. Paris, Librairie Scientifique Hermann, 1954-1959. Dr. Loren Eiseley, Darwin's Centenary: Evolution and the Men who Discovered it, Doubleday: New York, 1961. Reijer Hooykaas, Religion and the Rise of Modern Science, Regent College Publishing, 2000. Ian H. Hutchinson, Professor of Nuclear Science and Engineering, Massachusetts Institute of Technology. Monopolizing Knowledge. Various talks and essays on the relationship between science and Christianity. Stanley Jaki, The Origin of Science and the Science of Its Origin. South Bend, IN: Regnery/Gateway, 1978. Stanley Jaki, The Savior of Science, Washington, DC: Regnery Gateway, 1988. Eugene Marion Klaaren, Religious Origins of Modern, Science: Belief in Creation in Seventeenth-Century Thought, Grand Rapids: Eerdmans, 1977. James Hannam, God’s Philosophers: How the Medieval World Laid the Foundations of Modern Science, Icon Books, Ltd., 2007. James Hannam, The Genesis of Science: How the Christian Middle Ages Launched the Scientific Revolution, Regnery Publishing, 2011. Robert K. Merton, "Science, Technology and Society in Seventeenth Century England," Osiris, Vol. 4, 1938, pp. 360-632. “I think there's a common assumption that you cannot both be a rigorous, show-me-the-data scientist and a person who believes in a personal God,” says Francis S. Collins, former Director of the National Human Genome Research Institute at the National Institute of Health. “I would like to say that from my perspective that assumption is incorrect; that, in fact, these two areas are entirely compatible and not only can exist within the same person, but can exist in a very synthetic way, and not in a compartmentalized way. I have no reason to see a discordance between what I know as a scientist who spends all day studying the genome of humans and what I believe as somebody who pays a lot of attention to what the Bible has taught me about God and about Jesus Christ. Those are entirely compatible views. "Science is the way -- a powerful way, indeed -- to study the natural world. Science is not particularly effective -- in fact, it's rather ineffective -- in making commentary about the supernatural world. Both worlds, for me, are quite real and quite important. They are investigated in different ways. They coexist. They illuminate each other. And it is a great joy to be in a position of being able to bring both of those points of view to bear in any given day of the week. The notion that you have to sort of choose one or the other is a terrible myth that has been put forward, and which many people have bought into without really having a chance to examine the evidence. I came to my faith not, actually, in a circumstance where it was drummed into me as a child, which people tend to assume of any scientist who still has a personal faith in God; but actually by a series of compelling, logical arguments, many of them put forward by C. S. Lewis, that got me to the precipice of saying, 'Faith is actually plausible.' You still have to make that step. You will still have to decide for yourself whether to believe. But you can get very close to that by intellect alone," Collins says. Should science be the be-all and end-all in the pursuit of knowledge? In Reply to a Letter of David McClure, Esq. on the Subject of the Proper Course of Study in the Girard College, Philadelphia. New Haven, October 25, 1836, Webster wrote, "Any system of education, therefore, which limits instruction to the arts and sciences, and rejects the aids of religion in forming the characters of citizens, is essentially defective." “You’re gonna like it here,” Plait says of the cosmic sandbox, and so we should. The application of science enables us to understand our surroundings, and ourselves. We learn this universe has rules of logic, function and design. Christians recognize that God created this cosmic sandbox, that there is Moral Law in addition to Natural Law. Or to put it another way: Science is good. Science, coupled with moral principles, is even better. Sounds reasonable, doesn’t it? When performing reviews of authors as has been done here in the E-Block, it is not often that I find myself having to stop reading a work before I finish it, in order to preserve my sanity. It happened in this case with one of the works of Arthur Pink. It is not so much that there is a great deal wrong with Pink (there are a few problems – see below). This prolific author, who wrote early in the 20th century, was one I chose for the start of this new series for two reasons. One is that I recall, in my first church, that his works were all over the church library, indicating that someone at least considering Pink worthy for others to indulge in. The other reason is that I recalled Pink as being one of the few evangelical sources read by Skeptic Steve Allen in one of his books on the Bible. Unfortunately, Allen apparently thought Pink was the best scholarship we had to offer and had something of a temper tantrum over how gullible Christians are for thinking so. But Pink wasn’t a scholar; his works, in the main, are devotional. And they’d have to be. I have spoken very often of authors who are mainly effective at saying in 5000 words what could have been said in 50. Pink exceeds the margins of that description significantly, often saying in one to three chapters what could have been said in 50 words. I could not but be bewildered by reviews on Amazon that described Pink’s work as “spiritual gold” or “meat”. I can only suppose that such readers were so mesmerized by the repetition that they mistook a 200 ton tough-as-leather steak for a delicate filet mignon. As noted, Pink’s greatest shortcoming is a galling habit of reiterative repetition. Some 85% of Pink’s material is repetitive exhortation – the same few ideas repeated ad nauseum in a wide variety of ways. Most of his doctrine is sound, however; I only found a few disturbing elements. There is, in Pink, an occasional snideness towards academics. While he rightly says (mainly in PC – and at least 10 different ways) that a dedicated heart makes for a more earnest Christian than a trained mind, he fails to see that unless the mind is sound in loyalty, the heart has no anchor. In that sense Pink is very much like modern emergents who assume that their own ability to remain loyal to Christ through emotional attachment will serve as well for all. Pink relatedly blames the ebbing of Christianity on “a grieved and quenched Spirit in our midst.” But he doesn't do much to explain how we can differentiate the Spirit from personal preferences, other than contextually common sense tests like "it doesn't contradict the Bible." Pink does little in terms of dealing with difficulties with the text. While he has occasional harsh words for cultists or others who compromise the Gospel, Pink seldom deals in any hard questions. To be fair, this is not unexpected since his purpose is mainly devotional. But it also means that those who call his work “meat” are seriously overestimating it – or else I’m overestimating them. When Jesus born, Herod was “troubled” (Matt. 2:3) and when Spirit was given, multitude was “troubled” (Acts 2:5. 6). The latter example is a bit problematic because the two words used in Greek are not the same. Even so, one wants to ask Pink of these parallels, “What’s your point?” These parallels are mostly contrived. He tries to explain that the presence of the word “church” in Matt 16:18 is not an anachronism, because the Jews rejected Jesus, and that means that the “church” has “superseded the Jewish theocracy.” This only works as an explanation for the presence of the modern, English word, “church” – the word used in Greek was used of any assembly of persons dedicated to a cause. While most of W4G does fairly well in explaining why the four Gospels differ, some explanations are simply outlandish. Pink says that there is no genealogy in Mark, because Mark portrays Jesus as a servant of God, and “in connection with a servant a genealogy or particulars of birth are scarcely points of interest or importance.” This is false: Such things were always of utmost importance to the people of this era. A few of Pink’s explanations create problems he apparently doesn’t recognize. For example, he tells us that Mark does not relate Jesus saying, “it is finished,” because “It is not for the Servant to say when his work is finished – that is for God to decide!” But if Jesus did historically say this as e.g., Matthew relates, then the servant DID say when his work was finished, and Pink has implicitly indicated that Mark is leaving out information dishonestly – though I doubt if Pink thought through and realized that this was what his argument implied. A couple of other outlandish ideas: Mark uses “and” a lot to start sentences because it “tells of ceaseless activity” of Christ. Luke 2:1’s reference to taxation “tells, in suggestive symbol, of the burdens imposed by Satan on his captive subjects.” These are simply out in left field, if not over the fence. Most embarrassingly, in PC, Pink opens the volume with a quote of Mark 16:16, and says of it, “None more important were ever spoken to the sons of men.” Given the serious textual issues surrounding this verse, and the fact that use of it and surrounding verses has caused seeds of doubt in some (see link #2 below), Pink’s use of it should inspire uneasiness. Such is what we think of Pink. I suppose his work might appeal to those who appreciate being mesmerized by walls of text, and for the most part, his ideas are sound. However, it’s all been done a lot better, and a lot more efficiently, since he was active. 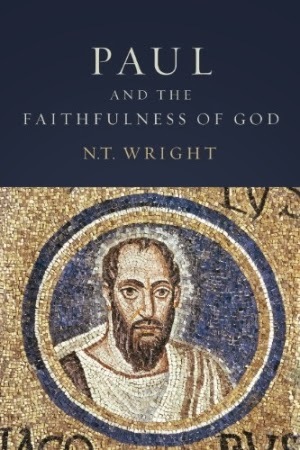 Review: N. T. Wright's "Paul and the Faithfulness of God"
Guest writer Ross Harriman provides the review for this one, which is just as well since my copy is likely to be waiting a while! Frequent Tekton readers will know that JP has given glowing endorsements and made extensive use of books by N. T. Wright, especially The New Testament and the People of God (1992), Jesus and the Victory of God (1996), and Resurrection of the Son of God (2003). These three books are part of a planned six-volume series entitled Christian Origins and the Question of God. Well, the fourth volume—Paul and the Faithfulness of God (hereafter, PFG)—has finally come out. I feel criminal providing such a short review of a book of such mass and magnitude, but I am afraid it must suffice. He analyzes the worlds in which Paul lived and with which he interacted in new ways as a Christian: namely the worlds of second-temple Judaism (particularly Pharisaic Judaism because Wright argues that Paul was a fundamentally Jewish thinker), Greco-Roman philosophy and religion, and the overarching Roman Empire. In each case, he provides the worldview analyses that are typical of this series in terms of analyzing stories, symbols, praxis, and answers to key worldview questions (Who are we? Where are we? What is the Problem? What is the Solution? What time is it?). For frequent readers of Wright, the chapter on Pharisaic and other Jewish worldviews will be mostly reruns, though there are some important areas in which he expands points he has made before (such as centrality of the Temple as a worldview symbol, the role of the Temple as a microcosm of creation, and the many texts in which there is a sense of Israel continuing in exile). The other chapters in this section are generally new and the one on the rhetoric and religion of the Empire is especially edifying. The three central chapters of PFG are what Wright indicated in the quote above: the reworking of central Jewish beliefs—monotheism, election, and eschatology—around Jesus and the Spirit. The issues he addresses here include: Pauline Christology as the Christology of divine identity (i.e., saying about Jesus what had been said about YHWH), with an emphasis on understanding Jesus as the return of YHWH in person; the Spirit’s role in the new Exodus, with a similar emphasis; the problem of evil in this theology; the role of Israel’s election; the Messiah and election; Paul’s view of the Torah/Law; justification; the work of the Spirit in constituting the people of God; the already/not-yet nature of eschatology (i.e., inaugurated eschatology); ethics in inaugurated eschatology; and the eschatologically redefined Israel. As one can see, these three chapters constitute the thickest part of PFG , not only in terms of volume, but in terms of density and substance. Apart from the mere fact that he addresses these many issues, PFG has several virtues worth noting. As is generally the case with Wright’s books, PFG demonstrates its writers rare blend of erudition and elucidation. He knows Paul well after spending time with him over the last few decades and he is able to communicate that knowledge in an engaging and sometimes amusing style (though there are times when the reader may not be able to connect with certain allusions and illustrations). Probably the greatest strength of PFG is its incredible ability to integrate all of its various elements into a coherent whole. Wright argues that Paul’s theology was fundamentally coherent. The divergent schools of Pauline studies have latched on to what have often been thought to be contradictory notions (such as justification declared on the basis of faith vs. participation in Christ; a salvation-historical understanding emphasizing continuity with what had come before vs. an “apocalyptic” [falsely called] understanding emphasizing a clean break from what had come before; the work of the Spirit vs. the work of believers; the Torah as good vs. the Torah as a stumbling block), but those notions belong together when one understands Paul’s apostolic mission and the theology explicated therein. As Wright shows again and again, in one way or another, the story of the faithfulness of God pulls these threads together into a tapestry. Each part of Paul’s theology belongs with the other parts and each part has a role in addressing elements of Paul’s worlds. These results come from Wright’s determination to fit in all of the data he has available, with appropriate simplicity, in order to shed light on other areas. Another strength—which the other books in this series share—is the proper distribution of space Wright manages in engaging thoroughly with the primary texts and in addressing the current state of scholarship. He does more of the former than the latter—which is as it should be—but he does enough of the latter to keep the reader well-informed of that state of scholarship. Of course, he has to choose his conversation partners carefully and cannot interact with all scholars here in equal measure, but such is to be expected. In any case, it is a useful and enlightening analysis of and contribution to the Pauline areas of Christian Origins debates. He does not examine all Pauline books thoroughly as PFG is not a diachronic analysis (in this case meaning that it does not go through each book in a systematic fashion) but a synchronic analysis (in this case meaning that it does draw together and analyze overarching stories, themes, instructions, and theological claims). One advantage of this approach is that he examines several passages from multiple angles and thus brings out the multiple functions each passage has within Paul’s purposes in writing. While an attempt at drawing out such multiple layers and functions in a diachronic analysis could be too cumbersome, in this kind of analysis it is fitting and the reader can surely benefit from seeing how Wright tilts the jewels of Paul’s letters this way and that in the light of the story of the gospel to see the kaleidoscopic refractions of that light. A final strength I note here that I wish I would see in more books is Wright’s use of scriptural echoes. What this concept means in short is that when he sees Old Testament quotes or allusions in the New Testament, he does not only consider the meaning of the particular verse(s) quoted, but of the context in which that verse (or those verses) appears. He works under the assumption that when Paul uses such quotes and allusions, he intends to evoke the resonance of the rest of the passages or stories in which those quotes and allusions appear. This technique establishes even deeper connections between the story Saul of Tarsus knew and the story Paul the apostle knew. Wright demonstrates the validity of this assumption frequently when he explicitly teases out those connections and illuminates the New Testament passages with the light of the Old Testament. However, there are some obvious drawbacks. One, the sheer size of this tome may prove unwieldy for some. If you thought Wright’s last book in the series was big, this one is more than double the size (it weighs in at around 1,500 pages, not counting bibliographies and indexes). In fact, his three central chapters (in which he analyzes how Paul reshaped Jewish monotheism, election, and eschatology around Jesus and the Holy Spirit) span almost 650 pages. Still, even if reading straight through this work may be difficult for some, it is still quite useful as a reference work in which one can consult particular sections. At the same time, because it is a big book, there is an obvious question of affordability and this book is not cheap by any measure (except by the measure of books written in gold). Two, as one might expect from such a massive book, there is some repetitiveness. Personally, it didn’t bother me, but I know it can be irritating (for such people, I would once again recommend using it as a reference book). I am inclined to think that this repetitiveness serves three functions. First, for a scholar who thinks his critics have often misunderstood him, it serves a clarifying function. Second, since repetition is important for learning and memory, it serves a pedagogical function (which in turn plays into the first function). Similarly, third, in his rather lengthy chapters (there are only sixteen), repetition can help the reader keep the foci of the chapters in mind. Still, I know it bothers some readers and it is worth noting. Three, even Wright has some trouble keeping a clear mind as to where everything is. There are some footnotes where page number references to other parts of PFG simply have 000 instead of an actual page number (and sometimes actual page numbers are either off or too broad in range). The indexes can help to an extent here, but it nevertheless can be somewhat irritating. Overall, Wright’s magnum opus on Paul is a truly magnificent, majestic, and magisterial work. We had to wait a long while for it, but it was worth it. It is an essential work for anyone who wants to understand Paul and the story he told. Even if you should not necessarily buy it at this time, you should definitely pick it up at a library. Whatever you do, be sure to sow a seed of attention and you will surely reap wonderful fruit of insight. Book Plunge: What Have They Done With Jesus?